CMT/WICO Automata Prototyping — Wonderful Idea Co.
Over the past few months, we've been working with the amazing folks at Cabaret Mechanical Theater (CMT) to experiment with ideas for professional development workshops, refine kits for cardboard automata explorations and construct environmental elements for museums hosting their traveling exhibitions of inspirational automata. 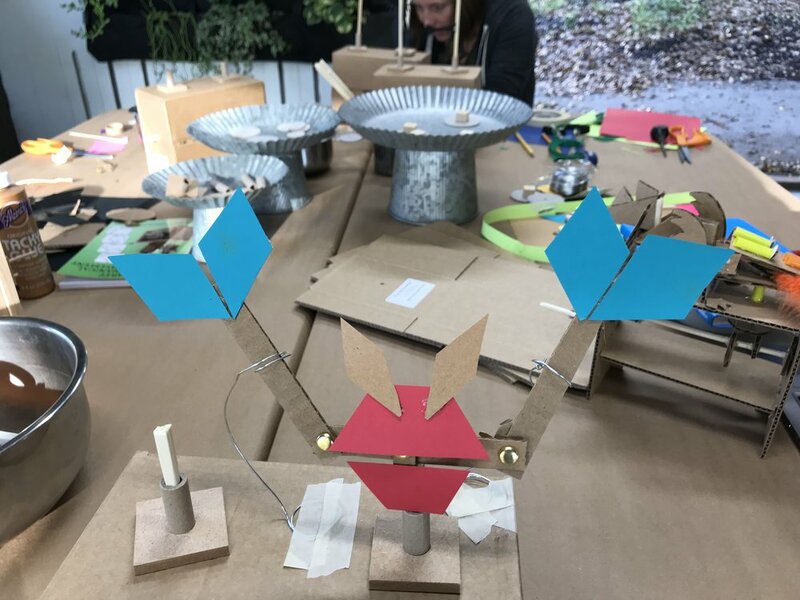 Cardboard automata is an activity that we helped develop while we were at the Exploratorium's Tinkering Studio and this workshop represents a starting point for our investigations. But there are a couple of aspects of the activity that we are hoping to develop further to add in scaffolding and starting points to support museums without a dedicated tinkering space. As well, we're interested in ways to bridge the gap between the inspirational automata built by the artists of CMT and the initial versions made by museum vistiors. Building cardboard automata is one of the most challenging tinkering activities for participants and facilitators. To build a working machine, there are a series of steps that need to be done in order before you can really start experimenting. As well, the combination of parts that need to be stable and parts that require free motion requires delicate tweaking and often times lots of frustration before getting the machine to work. Making the construction of the basic mechanism a little easier might help learners more quickly get into designing their own movements or working on the artistic or narrative elements. Enter an adjusted kit developed by Fire the Inventor, another organization that frequently collaborates with CMT. There are a few changes that help speed up the process, including retaining the flaps of the box to more quickly make a stable frame, using square chopsticks and cardboard cams to make press fit connections and adding a custom wooden handle to make it easier to turn the crank. These kits also come with pre-punched holes for two different moving elements which encourages thinking about having the parts interact or combine to form a single element. To this effect, I constructed a dragon inspired by a Peter Markey automata. We hope that the prompt of getting the two pieces to work together might inspire some unique ideas. As tool to help address the challenge of coming up with a topic for the character, I had the idea of creating a random automata generator. At first, this took the shape of a scratch program that picked out unusual combinations of pre-selected nouns and adjectives. Next I followed an set of instructions for creating a twitter bot that has been auto-posting different suggestions for (inspiring?) automata motifs. Another way, that we hope we can address the 'blank page' problem, where people have trouble coming up with an idea for their machine, is by limiting the set of materials. A first prototype used only black paper and colored shape blocks. The black paper shapes referenced the amazing work of Federico Tobon of WolfCat Workshop who undertook an amazing 'makevember' project of building a tiny automata each day. He took the simple black paper and created a wide variety of expressive characters that really stand out against the natural materials used to make the mechanisms. Nicole took the same look and feel to create a little cat with movable, posable limbs. In a way this also really similar to the Cabaret guide and examples which use Paul Spooner's Bearcat character to demonstrate different ideas. The other material that we were experimenting with are brightly colored wooden blocks used at the exploratorium tiling table and animation station. 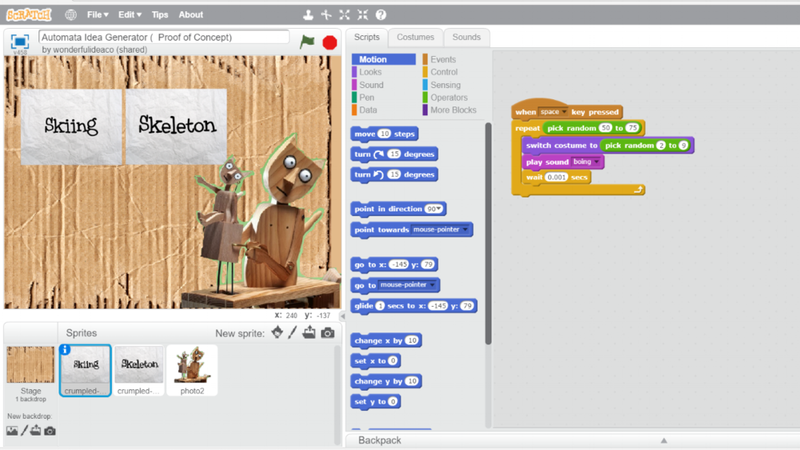 We're interested in playing up the connection between the way automata and animation can encourage learners to use simple materials to construct unexpected creations. We'll be testing these two activities in tandem at the California STEAM Symposium next weekend at the Moscone Center in San Francisco and it will be interesting to see the connections that can be made between the two modes of creative expression. As well, since the audience will mainly be teachers and others working in formal education settings, we're interested in trying to articulate the connections that these two workshops have to the NGSS standards. Over the next few months we're hoping to continue the explorations and experiments with Cabaret Mechanical Theater, introducing the process of building to kids and adults.